My boy and I are so sick these days, the dreaded colds and flu from January have continued into February and there seems to be no end in sight. Everything is such an effort for the both of us me, he's still bouncing around the house in his sick state, seriously, where do toddlers get their energy from and why do we lose it as we grow up?! I put together this little sweet treat to cheer us both up - unicorn food! This is super simple to put together, it's just about adding as much colour as you can. Tyler Lee's was substantially healthier than mine, he just had some ice-cream, sprinkles and rainbow drops, I went all out - marshmallows, Lovehearts, pastel sweets and edible glitter, it was amazing. It's funny how something so simple can really make your day, I loved all the texture with the raspberry ripple ice-cream, yum is the only word I can use to describe this concoction. My little one really did love this, especially the rainbow drops and I was glad because they were the only healthy thing in the mix really, rice adorned with all the colours of the rainbow. I have so many healthy version of this in my head but to be honest, being this sick, an injection of sugar isn't going to do me any harm and the ice-cream really helped to soothe mine and Tyler Lee's sore throats... any excuse for ice-cream! I think unicorn food is the perfect name for this mixture of colour, it's so pretty, just like a unicorn (liking my thought process there)! This would be such a fun thing to put together for a birthday party or date night with a good film, it's such a simple thing to just pop lots of sweet treats in a bowl but it's so good. I'll have to make a version with skittles and jellies for my other half, he'd love it. A spoon of unicorn loveliness! The unicorn food really cheered my boy and I up, ice-cream really can solve all the worlds problems (or our sore throats at least!). I love putting together little treats like this for us to have during our mama and baba time. The best thing about unicorn food is that you can pop whatever you like into the bowl. I'd love to try this with some mango frozen yogurt next time and some colourful fruits (a lot healthier than this version I'm sure you'll agree). Unicorn Food can be put together using anything, just as long as it's colourful of course. Do you like the look of my unicorn food creation? Would you love a bowl of this too? That looks so yummy! I know my kids would totally love to eat this! I love eating food that's colorful. The presentation looked wonderful and appetizing! Yes, I absolutely like it! Thank you Rochkirstin! The more colourful the better! I wouldn't mind some myself! How fun! I know my nephews would absolutely love to make and have this :) Super cute idea! My daughter has been super sick with colds and sinuses this winter. She has missed more school this year than she has in a while. Even though she is 16, she would appreciate me making her unicorn food to cheer her up! I hope you all feel better. This looks yummy and you couldn't have picked a better name. I hope you both feel better quickly! I am so sorry you feel yuck! This looks awesome, it's really pretty! Unicorn food is brilliant! I know my kiddos would love either. My girls would probably request it every day!! Very neat idea! I hope you are all well now? And, keep that way - and your work on this and your images are so fun - thank you for sharing! This is such a good idea! It's pretty amazing! This is such a great idea! I love how you came up with this! I'm sure it cheered up your son and you big time! That is awesome! I want some!! Wow that's some awesome unicorn food right there! Very colorful! We are definitely in need of unicorn food! It looks divine. Not to mention that we have about 20 unicorns living in Emi's room! This is a cute idea! I think my kids would love this Unicorn Food. Looks tasty and sweet. That sure looks cute. I'm sure children love it. Thank you for sharing. This makes me want to get one of this for my boys. I'm sure this is a big treat for my 4 years old. So much fun. Kiddo would love this. Funny how something so simple can make us feel better when we don't feel so good. Oh my gosh! This is such an adorable idea. I'll have to make this as a fun little St. Patrick's Day activity and snack with my little girl. She would go crazy for it! Aww you are definitely an amazing mother. 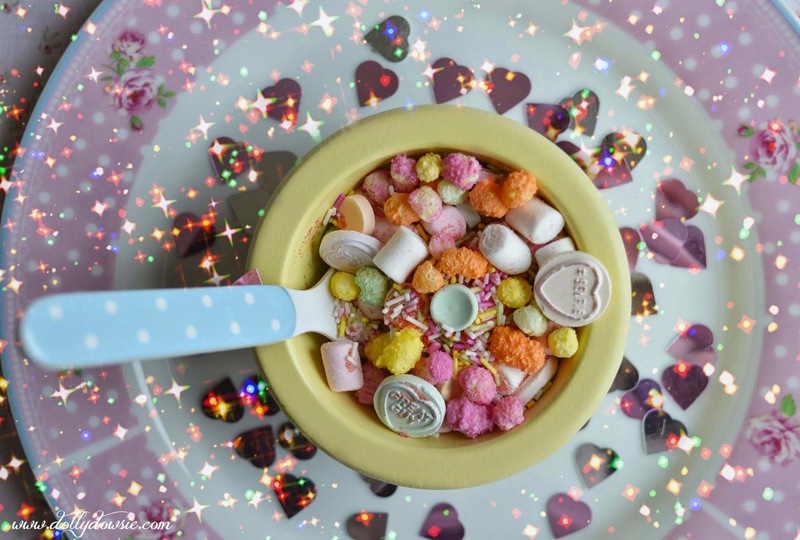 This unicorn food looks so yummy ♥ Ahh I seriously love reading blogs like this makes me so excited to start a family! Oh this looks like a ton of fun to eat!! My kids would love this snack what a great idea! I'm certainly not going to turn my nose up at that. What a delicious treat! This one is really colorful. I'm sure kids would love this one and enjoy its nutrients. The pastel colors are quite cute. Wow! That looks too good I can't eat it! Don't wanna ruin how it looks! Aww, hope that you and the little one are feeling better soon. Being sick is never fun, especially when you're a kid but I bet that Unicorn food made the day a little bit brighter. I love ideas like that to bring a bit of fun into an otherwise non-fun day. What a cute name. I remember loving the name unicorn when I was a kid. And you're right, that is the perfect name for that colorful treat. Hope your bundle of joy feels better soon. I can understand how difficult it is to manage when both you & your kid has to go through cold & flu at a time. It is great to see you have tried to cheer up on your own with Unicorn food, that looks so delicious. The pictures are so inviting & I a sure kids would love it. Gotta feed the unicorns, hahaha. Glad it helped soothe your throat. Feel better soon! So sorry to hear that your family hasn't been feeling well. That Unicorn food looks so pretty. O.m.g!!! This is awesome!!! My daughter just recently started watching this show called Animal Mechanicals on Netflix and is obsessed with the unicorn in the show. She would love to have some unicorn food!!!! I think the unicorn food would cheer me to up! Looks so yummy and yes sometimes the toddlers like to go easy on the sugar hahaha I hope you and your baby see the end in sight soon with colds. I am sick today with my first cold for the season and its no fun. Hope your little one feels better soon! This is an adorable idea sure to make any child (or adult) happier! Love it! Wow – that looks like a Valentine's Day dream. I had no clue that edible glitter existed; I am going to have to get my hands on some of that. I love the sparkly background you used to take the picture – very cool. So sorry to hear everyone is sick. It always stinks when the parent is sick, but oh man, what a cute idea. My daughters would go nuts. A great idea for our granddaughter. She loves things like this where she can nibble on it and play at the same time. I would definitely feel better again after eating this bowl. yum. I agree with you ... I think unicorn food is the perfect name, too. It is awesome. And I also agree that when you're sick, sometimes you just need to forget about what's healthiest and go for what makes you feel the best. This is so adorable! What a cute idea and I love what you did with your photos! I am sure your kids were so excited! That has to be the coolest name for a food, I've ever seen! On the other hand, all that sugar makes my teeth hurt. I hope ya'll get better!